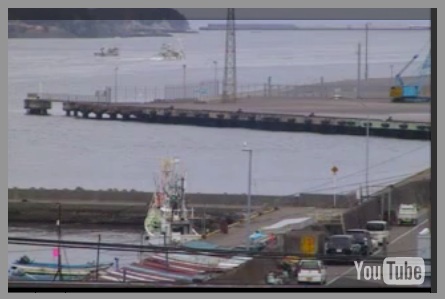 TOKYO --" Veteran fish seller Yoshito Shimada is under siege. At a grocery store in Tokyo's Shibuya district, mothers pushing strollers demand proof that the daily catch isn't from the waters off the stricken Fukushima Daiichi nuclear plant. "I tell them the government checks the fish for radiation, but they don't trust elected officials, or anyone," said Shimada, his blue shirt stained with fish blood. "A year after the disaster, Japan is still afraid of its own food." Even in Tokyo, more than 200 miles from the northeastern region devastated by the March 11, 2011, earthquake and tsunami that caused radiation to spew from the nuclear plant, residents fear that local schoolyards are laced with dangerous isotopes. Citizen collectives wander streets with dosimeters to make sure their neighborhoods remain radiation-free, conducting spot checks on fish and produce. A year after the worst natural disaster in their country's history, residents of Japan are still struggling to cope with the staggering toll of a catastrophe that left nearly 20,000 dead or missing. But a more insidious legacy may be a shaken trust - in their government, in their source of energy, and even in the food that sustains them. "Many Japanese feel they've been lied to by their government," said Mitsuhiro Fukao, an economics professor at Keio University in Tokyo who has written about the public loss of trust. "In a time of disaster, people wanted the government to help them, not lie to them. And many wonder whether it could happen again." Even though the tsunami had knocked out the cooling system at Fukushima, leading to meltdowns in three reactors, officials insisted that all was well at the seaside plant. 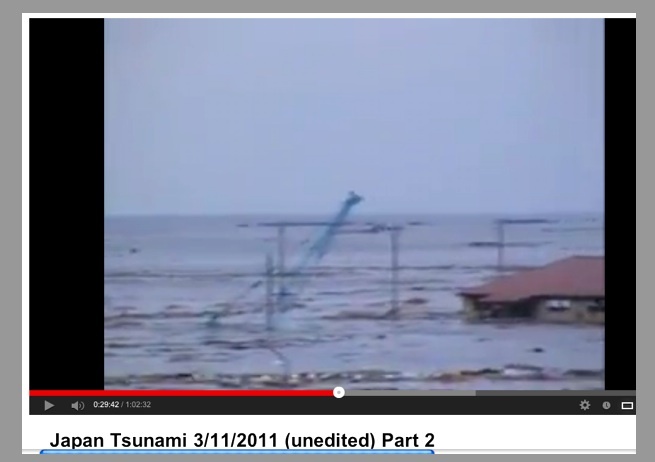 Recently released reports show that was far from the case... ... ..."
INCREDIBLE JAPANESE TSUNAMI HOME VIDEOS 1/3. we have already posted in these threads. This is the actual waveform of one of the aftershocks, sped up 100 times to put those destructive 0.1Hz to 20Hz waveforms up in to "our' human hearing range, to be able to "hear" it's power... and it's violence in nature, when the earth snaps. offered in the next posts. This is interesting... will those strange earth sounds that no one can explain point to a coming earthquake target for... Clintonville, Wisconsin? "MILWAUKEE � A minor earthquake occurred this week near the eastern Wisconsin city where researchers have been investigating a series of unexplained booming sounds, federal geologists said Thursday. The U.S. Geological Survey said the 1.5 magnitude earthquake struck Tuesday just after midnight in Clintonville, a town of about 4,600 people about 40 miles west of Green Bay. 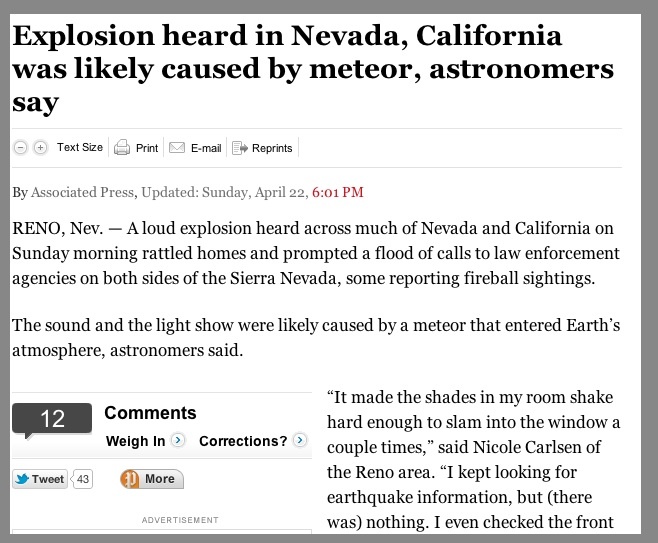 Geophysicist Paul Caruso told The Associated Press that loud booming noises have been known to accompany earthquakes. It's possible the mysterious sounds that town officials have been investigating are linked to the quake, he said. Earthquakes can generate seismic energy that moves through rock at thousands of miles per hour, producing a sonic boom when the waves come to the earth's surface, Caruso said. "To be honest, I'm skeptical that there'd be a sound report associated with such a small earthquake, but it's possible," he said. 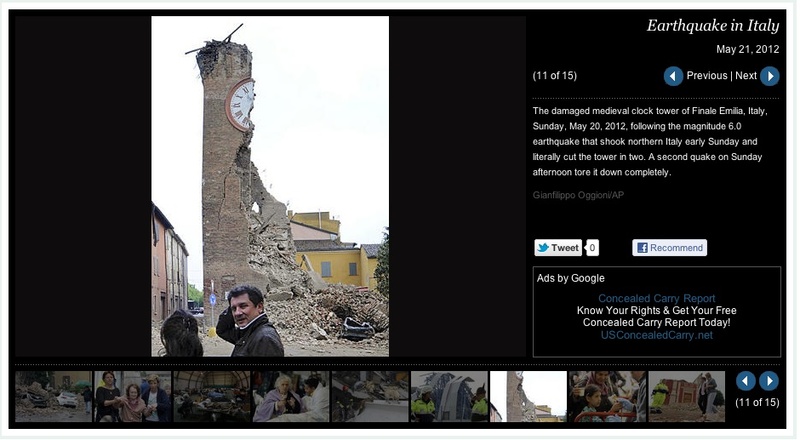 ..."
"Clintonville resident Jordan Pfeiler, 21, said she doubted an earthquake caused the noises. She said the booms she experienced were in a series over the course of several hours and not continuous as she might have expected if they were caused by an earthquake. Still, she said, "It's a little scary knowing Clintonville could even have earthquakes." "Jolene Van Beek, 41, had been jarred awake several times by late-night rumbling this week. When asked by telephone Thursday whether she thought the noises were caused by an earthquake, she joked that she was at a nearby lake "waiting for the tsunami to hit." 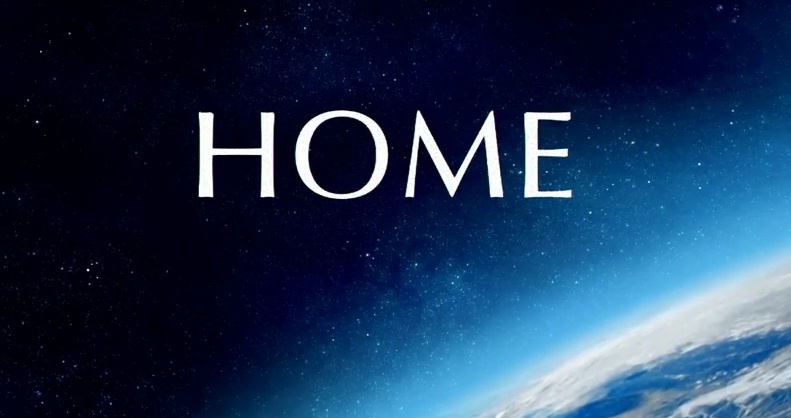 Could strange earth sounds become an advanced warning that an earthquake is on the way? Fascinating, strange stuff. Could this be onto to something with respect to earthquake prediction? 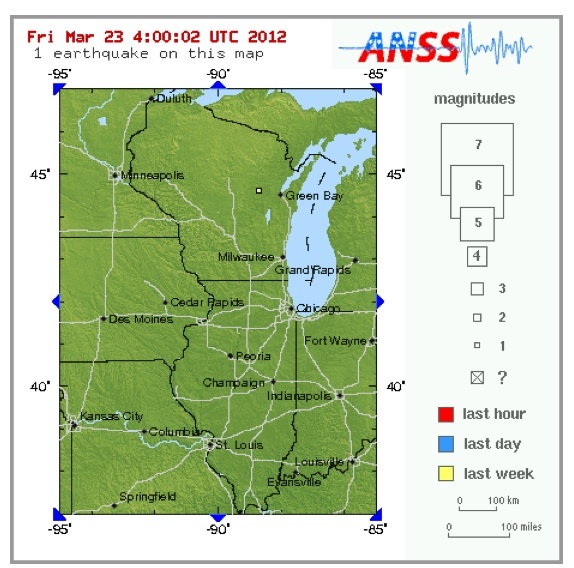 "...the ground is shaking in an unusual way"
Will Wisconsin be the next epicenter of an earthquake event? Is there any fracking going on anywhere nearby? Could it possibility signal of the birth of a new volcano? Hoping that nothing bad happens from this total mystery. Looking at these now Geno. The new ones you posted of Japan are really something! What's happened to part 1? 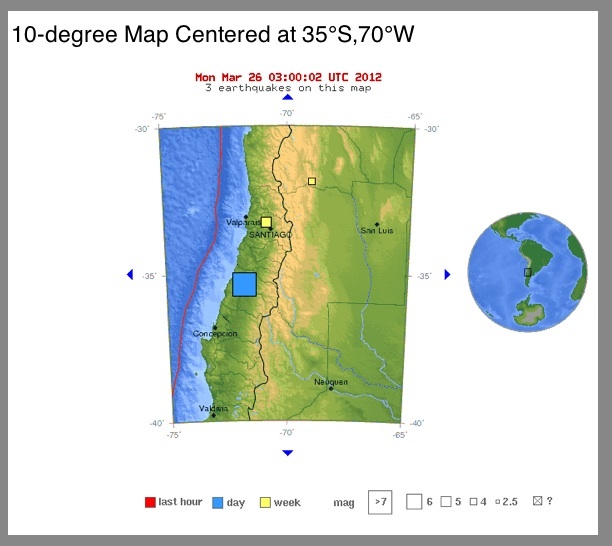 � "A magnitude-7.1 earthquake struck central Chile Sunday night, the strongest and longest that many people said they had felt since a huge quake devastated the area two years ago. Some people were injured by falling ceiling material, but there were no reports of major damage or deaths due to quake-related accidents. The quake struck at 7:30 p.m. about 16 miles north-northwest of Talca, a city of more than 200,000 people where residents said the shaking lasted about a minute. Buildings swayed in Chile's capital 136 miles to the north, and people living along a 480-mile stretch of Chile's central coast were briefly warned to head for higher ground. Residents were particularly alarmed in Constituci�n, where much of the coastal downtown at the mouth of a river was obliterated by the tsunami caused by the 8.8-magnitude quake in 2010. "There are some injuries but nothing serious," said Interior Minister Rodrigo Hinzpeter, who was serving as acting president while Sebastian Pinera is on tour in Asia. The Chilean navy's hydrographic and oceanographic service and the national emergency office called off a tsunami warning for most of the central coast after an analysis showed the quake wasn't the type to provoke killer waves. in the towns of Iloca and Duao. 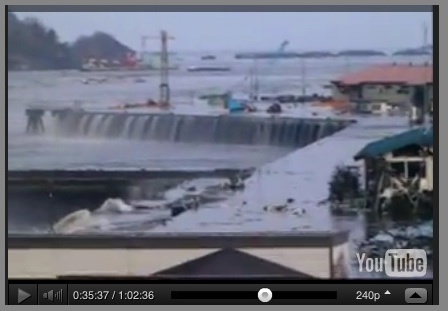 A sharp outsurge of surf sometimes is followed by a tsunami.... ..."
especially if the ocean even hints of retreating! Mixey, did You see anything last night (or hear any sonic booms) or other fun stuff? while employed in political office??? back to Natural Disasters... across the globe. TOKYO (AP) "� Japan is marking the second anniversary of its earthquake, tsunami and nuclear catastrophe. More than 300,000 people are still displaced and virtually no rebuilding has begun. ... ..."
"...Some 160,000 evacuees remain uncertain if they will ever be able to return to abandoned homes around the Fukushima Dai-ichi nuclear power plant, where rectors melted down after the tsunami. ... ..."
Hard to forget that night as Japan's nightmare unfolded nearly live over the internet. from that days' ...triple disaster event. Mixey!!! Did You feel this one, or the aftershocks? "...Monday morning's magnitude 4.7 earthquake in Riverside County was the largest temblor to hit the Los Angeles region in three years and has produced more than 100 aftershocks. to the San Andreas Fault. It's one of three fault zones that absorb friction ... ... "
I'm so pissed off at this needless tragedy!!!!!!!!!!!! Why in the hell don't ALL of these people have underground shelters to go to????????????????? Shouldn't this be a requirement???????????? We have to meet all sorts of seismic requirements out here in California. Shouldn't these people be required to have a safe place underground... ESPECIALLY FOR A SCHOOL!!!!!!!!!!!!!!!!!!!!! The students were sent to a restroom. These people don't even have a collective brain between them. Obama... If they want federal help, somebody needs to get in there, tune this place up and create A PLAN for the future! Don't just clean it up and rebuild!!! Tonight's 5.1 earthquake in CA happened while Mixey & I were talking on the phone, coast to coast, catching up on "stuff". Mid sentence, Mixey stopped and said something like ... 'woah, we're having an earthquake' . While it was shaking there at Mixey's House, I went to the USGS site from here in PA... at that time it was just being posted as an M3.6 ... the M5.1 followed. A M5.1 earthquake occurred at 9:09PM on March 28, 2014, located 1 mile easy of La Habra, CA, or 4 miles north of Fullerton, CA. The event was felt widely throughout Orange, Los Angeles, Ventura, Riverside, and San Bernardino counties. 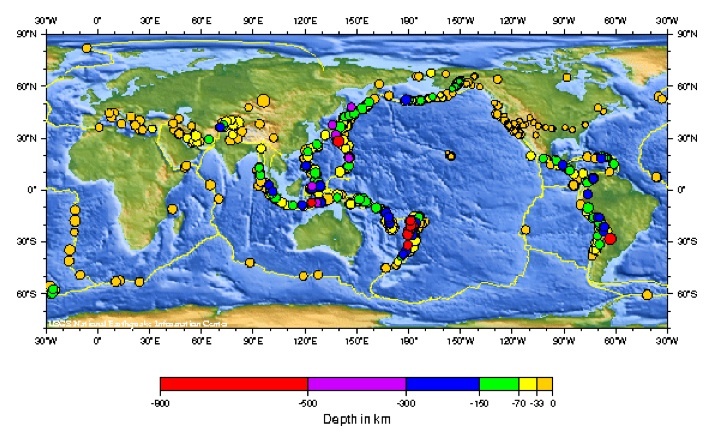 It was preceded by two foreshocks, the larger of M3.6 at 8:03pm. The demonstration earthquake early warning system provided 4 second warning in Pasadena. There have been 23 aftershocks as of 10:00PM on March 28, the largest of which was a M3.6 at 9:30PM, and was felt locally near the epicenter. The aftershock sequence may continue for several days to weeks, but will likely decay in frequency and magnitude as time goes by. 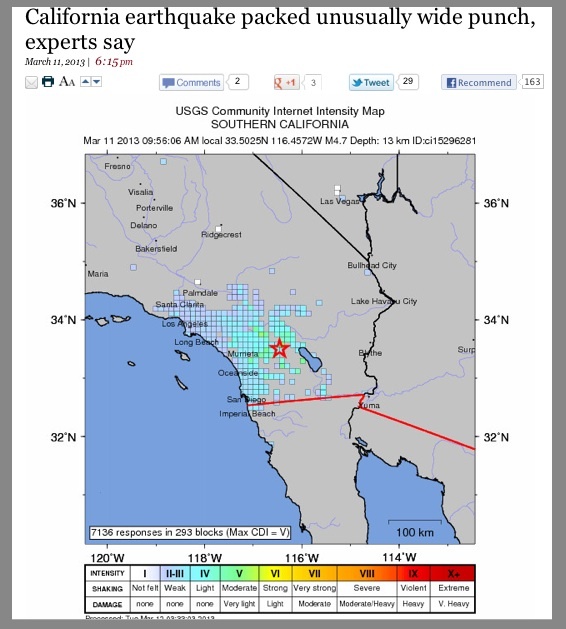 The maximum observed instrumental intensity was VII, recorded in the LA Habra and Brea areas, although the ShakeMap shows a wide area of maximum intensity of VI. The maximum reported intensity for the Did You Feel It? map was reported at VI in the epicentral area. This sequence could be associated with the Puente Hills thrust (PHT). The PHT is a blind thrust fault that extends from this region to the north and west towards the City of Los Angeles. It caused the M5.9 1987 Oct. 1 Whittier Narrows earthquake. Previously, the M5.4 2008 Chino Hills earthquake occurred in this region. It caused somewhat stronger shaking in Orange County and across the Los Angeles Basin. The moment tensor shows oblique faulting, with a north dipping plane that approximately aligns with the Puente Hills thrust. to possibly... save your life.